As we weren’t lounging in the sun yesterday, we decided to make the most of the time and prepare something for tonight’s dinner. We hadn’t planned on cooking anything so had to make do with what we had in the cupboards. Stephen suggested a curry made with pulses and this, from Camelia Panjabi’s book, fitted the bill perfectly. We’ve made chickpea curry before but it wasn’t a huge success. It was a quick and easy recipe from the BBC web site and it suffered from the lack of slow-cooking. This dish was the polar opposite, with lots of blending and browning and frying and simmering but it was definitely worth spending the extra time because this dish was far superior to the previous incarnation. The onions cooked down to form a deep and delicious sauce with a lot of woody spice character. We served it with basmati rice and some moong dal that we had cooked a few weeks ago and frozen. Soak the chickpeas overnight in five cups of water (we just soaked ours for four hours). Chop two of the onions and reserve. In a food processor, blend another onion with the ginger and garlic. Puree the tomatoes separately. Place the chickpeas and soaking water into a pot with the last chopped onion, the cardamomsa, cloves, bay leaves, peppercorns, cumin seeds, one teaspoon of salt and the asaofetida. Bring to tbe boil. Cook for 50 minutes. Drain and reserve the cooking liquid. In a separate pot, heat the oil. Add the reserved onion and saute for 25 minutes until brown. Add the pureed onion, ginger and garlic and cook for 10 minutes. Add the turmeric, garam masala, coriander powder and pepper and stir. After one minute, add the tomatoes and cook for a few minutes. Add the cooked chickpeas and stir. Add the water in which the chickpeas were cooked and cook until tender. Add salt. 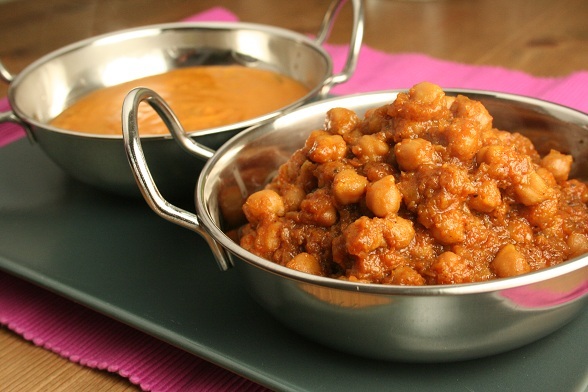 Subscribe to comments with RSS	or TrackBack to 'Chickpea Curry'. Never used asafoetida – what’s it like? .-= James´s last blog ..Meat Free Monday #16 – Red rice salad with grilled asparagus (and garlic mushrooms, grilled aubergine and avocado with walnuts) =-. James, Asafoetida is a very pungent spice, made from resin which is dried and crushed. Its pungency mellows when it is cooked and takes on flavours of onions and garlic. Its smell reminds me of spicy poppadoms in Indian restaurants, so I imagine it is an ingredient in those. It is also called Hing and is used often in lentil and bean dishes to aid digestion and reduce flatulence. I love chickpea or lentils currys for meat-free monday suppers! .-= Alex´s last blog ..Mixmaster TC =-. .-= Tom@roadsidecottagerecipes´s last blog ..How To Sprout Chickpeas =-. That’s a good idea, Tom, thanks. I’ve not tried sprouting anything so it could be a fun experiment.